I’ve been having a blast all day talking up the book, hosting games and giving out prizes, watching the reviews come trickling in. I almost forgot to ping you all and let you know the book is officially out there. Published. For reals. We actually ran OUT of books, if you can believe it. Multiple outlets are out of stock of the paperbacks, that’s how well today has gone. I am told that if you order them Ingram will print them to order, so if you’re looking to get a physical copy, ordering from Amazon or walking into a brick and mortar store will probably be your best bet. And once you have read the book, please consider leaving a review. That would be super cool. So far readers are loving the book. It’s got five stars on Amazon and Goodreads, but the more the merrier, so please consider taking the time to toss a review up on your platform of choice. I’m beat. It’s been a long, amazing day. I love you all. May the Code replicate Eternal. 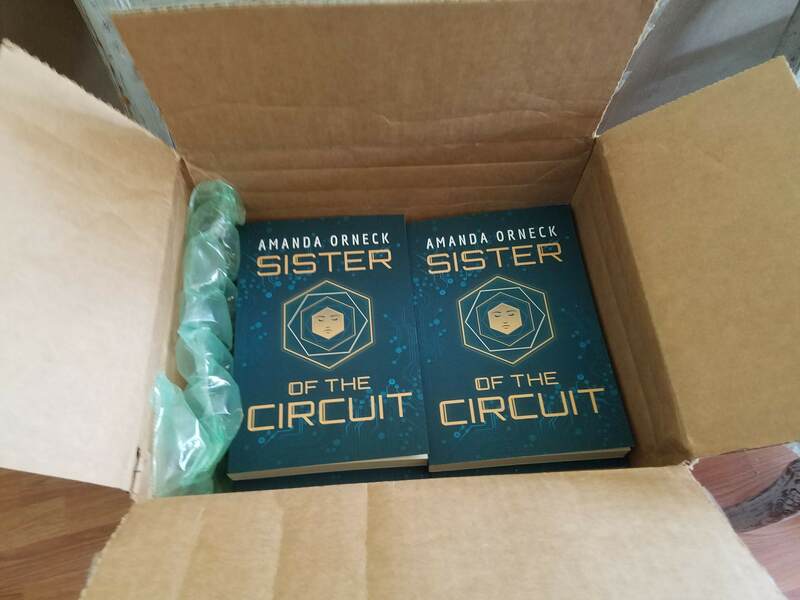 Today emails are going out with the ebooks of Sister of the Circuit. By now everyone who ordered physical copies should have them in their hands, which means Isidore and Dax, Surge and Evite are ready to sear your eyeballs with their adventures. For my part I have been working with the amazingly talented Jill Crenshaw, finalizing the audiobook. My plan is to have that launch on July 3rd along with the paperback and ebook publication date (you know, for people who aren’t awesome backers like you). If you’re the sort of person who likes your books read to you, it will be available on Audible and I’ll send out a link when it’s ready. If you’re a fan of reviewing things, would you mind reviewing the book once you’ve read it? Every voice talking about Sister of the Circuit on Amazon, Goodreads, iTunes, whatever, is a huge help. Thank you so much for your support, and have a great weekend. It’s been a long time coming, friends, but these little ladies have arrived. By now those of you who ordered physical copies should have received shipping notifications. When your books arrive, I’d love it if you posted a photo of them. I can’t wait to see how far the mech crew has spread. This is a book that was driven entirely by you, the readers. Without the interest in this book, it wouldn’t exist. It would still be a jumble of graphic novel pages, barely a whisper of what it would become. So today I celebrate you. Thank you for this gift of a book. Oh hi, how you doing? Feeling good? Having a good spring? Do you even have spring where you live? Here in Alabama the flowers are in bloom, the trees are green again, and the pollen plague is in full effect. I’ve been nose down in writing projects, but none of them have been the Circuit sequel because alas they’re for my day job. But hey, we got our first game launched, so that feels good. This week I negotiated terms for the Sister of the Circuit audiobook. I’m happy to announce that the amazing Jill Crenshaw will be narrating for Isidore, Dax, and CRI-LUX. I could NOT be more excited. I can’t wait to hear this story with her incredible acting ability. All is lined up to have the audiobook launched the same time as the other formats, so July is going to be a BIG month. Have I mentioned the launch team to ya’ll? I’m pre-building the book launch team now, you know, reviews and such, but I am giving away mugs, bookmarks, shirts, and a huge prize at the end for one lucky member. Want to be part of this? Head on over and sign up! Three months from today Sister of the Circuit will launch into the world like a weird, cyberpunk baby looking for cuddles. 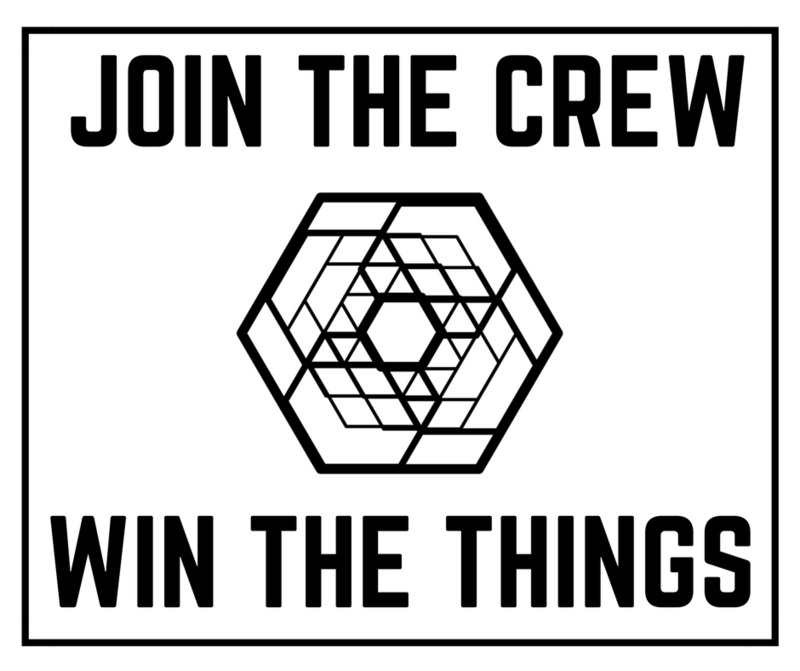 This means many things, not the least of which is that I am looking to build the book’s launch crew, starting with my core street team. This handful of people will be the inner circle of the launch crew, the elite of the elite -- the Sisters (or Brothers) of the Circuit if you will. Are you the sort of person that loves sharing books with your friends? Want to make a few dollars building a crew of people jazzed to see the book succeed right out of the gate? Then contact me for details! If you’re not interested in the street team idea but still want to be part of the launch, stay tuned. I’ll have lots of fun prizes and events for those looking to help the book build a review list and social media following for launch week. Until next time hexers, may the Code replicate eternal. Isidore RAM steps into the Font, sweeping the cables connected to her Shroud behind her like a train. She flips a switch, connecting her synapses to the Circuit and sighs one whispered phrase, like a prayer "July 10, 2018." That’s right friends, publishing day has been decided for Sister of the Circuit. Things are finally in motion, and you can find the Amazon preorder page for the book already if you click here. You all have been incredibly patient as I went through this process. Who knew that this little book would grow so much over the course of two years? I’m giddy with happiness knowing we’ll see the book published this year. If you haven’t gotten a copy (or want another one) go ahead and preorder one at Amazon. I’m sure Inkshares would love to know people are anticipating Isidore, Dax, and Clover. Thanks for being here with me. We’re almost at the finish line, and we all get to win the race together. It’s taken me nearly three months, but I am proud to say that the latest draft of this novel has been submitted to the editor. If you recall, during the spring 2017 I was invited into the first Cohort for Inkshares novel production. Part of that process was looking at the story from the bones up, and during all the work I did for the cohort I realized that the current title of the book doesn’t really fit what it’s become. Initially this was a graphic novel, a sort of retooling of Akira except with mechs. As I continued to write, the story morphed into something deeper, an exploration of what it means to treat technology as a sort of religion, and what would happen should it actually become one. As such, Isidore’s journey became much more tightly focused on her relationship with the Church of Technology. And the title of the novel, one that used to be about this fun sort of sci-fi romp, didn’t make sense anymore for her story. As I wrote this latest draft (number 4), I started thinking about the title and if it still served the story. I came to the realization that it did not. Therefore, I’ve decided to change the title of this book. Without further ado, I would like to introduce you to the new title: Sister of the Circuit. As soon as I made the commitment to the new title, I got super excited about how it connects to the themes of the current iteration of the novel. Now I step back in the editing queue to wait my turn to see what Inkshares thinks of the book. I would be lying if I said I wasn’t nervous. I’m going to pass the time working on another project to give myself some space from Circuit. Yesterday I got the clearance from editing master extraordinaire Matt Harry to start writing my final draft of Deus Hex Machina. Today I built my new editing scene list to help as a roadmap for what I’ll be doing for the next month. As you can see, most of the book is changing in some way, although a lot of the changes are going to be minor. I love this part of the process: Getting to dive into the book, polish up the rough edges and round out the wonky corners. It’s like falling in love with the story in a completely new way. I’m unsure what happens once I’m done with this draft, so for the moment I’m going to assume that I go into an edit phase like the rest of my cohort. My guess is that such an edit will be very brief because we spent so much time upfront preparing for the 4th draft writing phase. I can’t help but smile to think how far Isidore RAM has come. I am so proud of this little book, I can’t wait for you to get a chance to read it. I’m plum in the middle of my cohort production cycle for Deus Hex Machina, about to head back into rewrites once I get approval from my editor. In our discussions the illustrious Matt Harry has suggested that I rename the book. I am quite fond of the title I chose for the novel, but I am too close to the subject, so Matt suggested I survey you loverly backers and see what you think. Here is a link to a survey. Please hop on over and tell me which of the title options you prefer. The more responses I get the better, but I’m starting with you all because you backed the book and should more say than those that didn’t. At least that’s how I see it. I have a secret that I’ve wanted to share with you, but I haven’t figured out the right way to do it, so I sort of sat on it for a while. Now though, I think it’s time to let you know that Deus Hex Machina is heading into production. Just typing those words gives me a mixture of panic attack and rush of extasy. A couple of weeks ago I received an email from Inkshares letting me know that DHM, which had been submitted as a final manuscript in December, was going to be part of a new type of production schedule they were beginning this year. It groups authors into teams called cohorts, and sends them through the production process together as a sort of support system. I, along with several other authors, have been placed in Cohort 1. It’s all kinds of amazing. As much as I want to blab every single detail about what is going on, I’m not sure how much I’m supposed to say about this process, so I’m going to be a bit coy. Do know that things are happening, great things, and all of them will lead to a better book and a better writer behind it. So when will you get your books, lovely backers? According to Inkshares a Quill book (the base publishing level that DHM is filed under) has a production length of nine months. I haven’t actually received a timeline yet, so I don’t have a publication date for you. I can however surmise based on that general info that DHM should be out sometime early 2018. If I were a betting Mandie, I would say somewhere around late Winter. I’m not sure how to end this little announcement. I guess I’ll just say thank you so much for believing in me and my little book, and that you will have your book soon, dear friends.